Another weekend of fantastic weather meant that the Round Tekong Race was a breeze for all 31 participating boats. Despite a passing shower taking place in the early afternoon, the north-easterly winds did not let up, carrying the fleet around Tekong in a maximum of only 5hrs, with the fastest boat circumnavigating the island in 2hrs 27mins 53secs. The above honour goes to Nigel Signal’s Stray Catz, who only just missed out on beating his personal best by 3mins & 26secs! She leads the Beach Catamaran Fleet of 4, with the next Cat (Bad Influence) finishing a distant 26mins behind her. Bad Influence eventually takes 3rd place, surrendering 2nd place to Persian Cat on corrected time. The Wetas struggled to keep up with the Beach Cats in this race, with the fastest Weta R2D2 leading the pack. Despite being the first Weta to complete the race, a costly blunder of passing CAAS 2 on the wrong side resulted in a ‘RAF’ score for R2D2. This promoted Itchy-Go to first place, followed by The Striped One and The Blue Bug in 2nd & 3rd respectively. In the Cruising Multihull Class, it was line honours yet again for the mighty FireFly! But she only just misses out on podium this round, failing to put enough distance between her and the chasing corsairs on the final leg to finish. 3rd place was awarded to Miss Visayan, who made amends for a disappointing performance during last week’s Felkin Race. AbraCaDeborah remains the most consistent, scoring another 2nd to put her in the driving seat to clinch overall victory in her class. Jaza Too returns from holidays to start her season with a bullet, and will be looking to double that tally at next week’s Round Ubin Race. Our biggest fleet keeps getting bigger! Making up nearly half the entire fleet taking part in the Round Tekong Race, the PY Class was closely contested amongst the 13 boats in participation. Temptress of Down starts her 2019 campaign on a high, clinching line honours 15mins ahead of the next boat. Hot favourites Ikaroa continue their fine run with 2 bullets in 2 weekends, and is hungry to complete the Series with a clean sweep. Southern Light pulled an amazing overtaking maneuvre on leeward for a photo-finish just seconds ahead of Ikaroa. This rewarded her with a well-deserved 2nd place. The lighter and faster boats struggled to stretch their lead on the cruisers, with Arbudhen emerging as the best of the rest, securing 3rd place after corrected time. The return of Shardana livened things up in the IRC Class, giving front-runners Waka Tere and Jong Dee a run for their money. Shardana’s best efforts could only reward her with a 3rd on the podium, bested by Jong Dee’s line honours and eventual 2nd place on corrected time. Waka Tere wins by a slim 49 seconds ahead of Jong Dee, making it an extra-sweet victory for the former. She now leads the overall standings with 2 points from 2 races. 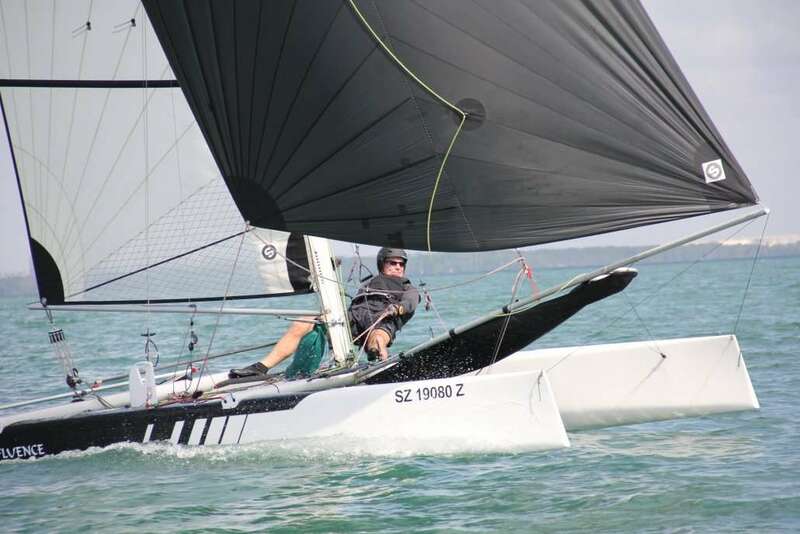 If Waka Tere continues her fine form in the Round Ubin Race, she looks poised to take overall victory in the IRC Class. Congratulations to all the winners, we look forward to consolidating the results and crowning 2019’s Signature Sunday Series Champions on 20th January!